NEW BRITAIN - Seniors especially, push the limits of being a high school athlete every day, knowing that this may be their last chance at playing the sport they love. 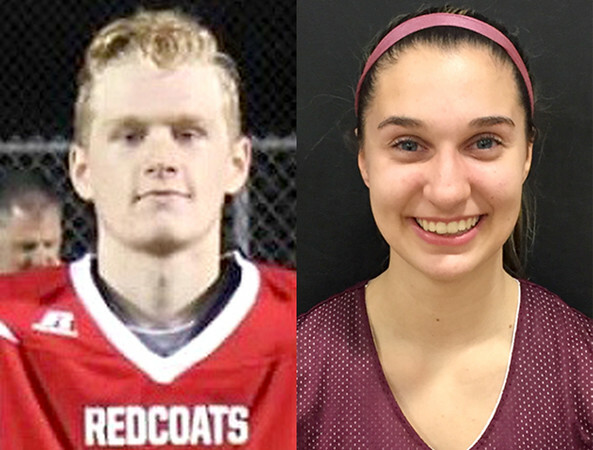 Berlin’s Matthew Wojciechowski and Innovation’s Bailee Nardi each turned in superb senior seasons, aiding their teams in any way they could to help them come out on top. It was a bittersweet end to the season for the Berlin football team. The Redcoats missed their opportunity at claiming the state title when they fell 49-7 to the top seed Killingly Sunday in the Class M semifinals.. As the Redcoats walked off the field with disappointment, there was plenty to reflect upon in their 2017 season, including resilient defensive work from Wojciechowski. The senior safety led the Redcoats in tackles this year, collecting a total of 115, averaging 10.5 tackles per game. Wojciechowski credits his success on the season to the amount of prep work the Redcoats have put in before each and every game. “Watching the film, knowing what the other team is going to do on the field has really helped me this season,” Wojciechowski said. One highlight of Wojciechowski’s season was when Berlin saw Plainville in Week 5. Wojciechowski intercepted his first career pass off Blue Devils quarterback Frank Griffin. The Innovation girls volleyball team had a successful season (20-4) as they claimed the CRAL title for the first time in school history as well as advancing to the Class S quarterfinals. The Ravens met and swept Aerospace in the CRAL title game with set scores of 25-8, 25-19 and 25-8. It was the fourth consecutive trip Innovation has taken to the league title game, this time ending in victory. The Ravens had plenty of strong performances this season, especially for senior outside hitter, Nardi, who finished the game against the Jets with seven kills. On the season, Nardi recorded 178 kills, 67 aces, 57 digs and 20 blocks, while setting two school records. She set the record for most kills in a single match at 14. She also set a new career-high of total digs in a single season. And she was rewarded for her play. The three-year captain was the first to be selected to the Class S All-State volleyball team in school history. Nardi accomplished many of the goals she had set for herself, including the All-State selection. Posted in New Britain Herald, Athletes of the Week, Berlin, Innovation on Monday, 4 December 2017 22:46. Updated: Monday, 4 December 2017 22:49.